Dubbed “Col from Colac” by Marty Carland and Steve Keating during his time on the AFL Cadet Squad Col Newcombe passed away on 15 July 2017 after an eight-month battle with cancer. Col’s later connection with the AFLUA as a trophy provider means a little part of Col remains with every association award recipient. 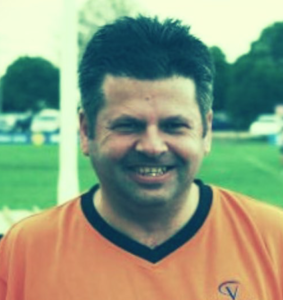 Colin Robert Newcombe was born in Colac on 22 April 1967 and grew up there a supporter of Coragulac Football Club. He played junior football in the local Youth Club competition and then played under-16s for Colac Imperials and Colac/Coragulac before trying a season of reserves football in the Colac and District Football League (CDFL) for Colac Imperials. After his playing days Col began umpiring in 1984 with CDFL Umpires Association which encompassed Colac & District, the then Western Plains, the then Heytesbury and the Hampden football leagues. Having umpired the 1988 CDFL Senior Grand Final, South Colac v. Winchelsea he came to the city and the VFL Cadet Squad in 1989 and “Col from Colac” was born. Over the next three years he umpired the VFL U19s, VFA reserves and U18s as well as the VCFL matches. Following the splitting of the now AFL umpiring list between the AFL and the newly formed Victorian State Football League Umpires Association Col moved onto the Southern Football League Umpires Association for 1992-93. He was awarded Most Dedicated Umpire in 1992. From 1994-98 Col would return home to Colac and umpire the very occasional game and from 2000-2002 he was an umpires’ observer with the Victorian Amateur Football Association. In 2009 he umpired five Colac District Football and Netball League matches and noted, “I travelled home on RDO’s and when work permitted, called them nostalgic rounds. An old mate is still umpiring and the plan was to do only one game in May which turned into more.” Overall it was estimated that he officiated in about 170 matches the various Colac competitions. And he never forgot his roots, regularly using his contacts to assist the umpires’ association to obtain jumpers and guest speakers for fundraising events. Add all this to his affiliation with the Football Integration Development Association (FIDA) and Col’s contribution to umpiring was immense and life-long. Through his business Col known to sporting clubs via the popular trophy and engraving store at Altona. He was also involved in community radio was part of the Sunshine and Western Region Sports Club. The extent to which he was admired in the community was the number who attended and the funds they raised for at a benefit night held in his honour just prior to his death.